Finally, we took a break to clear our heads and to start over again. For those of us who know Jesus, we want to model such insanity to all the peoples of the world because it is an insanity motivated by love, sacrifice, and obedience. It is an insanity motivated by going not staying. It is an insanity motivated by giving not receiving. It is how the world looks at God. This should be how the world looks at us. Join the insanity. 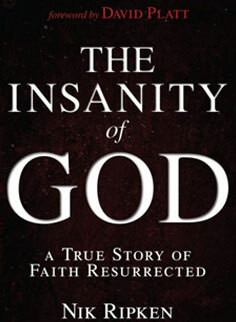 The film is based on the best-selling book Insanity of God (B&H Publishing) and is released in association with the International Mission Board, SBC (IMB). The movie was viewed by 90,000 in August and September 2016 in over 800 theaters in the USA. LifeWay Films hosted a simulcast of the film in early November and an encore simulcast March 2017. DVD and Video on Demand for the home use and for church license are available now for USA and Canada. Did you see the movie or read the book?